Murdoch, in death, re-wrote the seamanship manual for best practice. WILLIAM McMaster Murdoch lost his life, in common with one and a half thousand others, in April 1912.
other way, to swing the stern clear. But the berg impacted on the starboard side and opened several compartments to the sea. Murdochs manoeuvre has been much analysed, but was a product of his professional training. Only afterwards did the British Inquiry hear expert opinion from naval architects and others, delivered in the cold light of day, that it would have been better to ram the iceberg head on. The ship would not have sunk in such a scenario. Murdoch, in death, re-wrote the seamanship manual for best practice in such situations. Yet they happened again two years later! And a Captain was faced with making a decision on how to strike an iceberg, because escape seemed impossible. 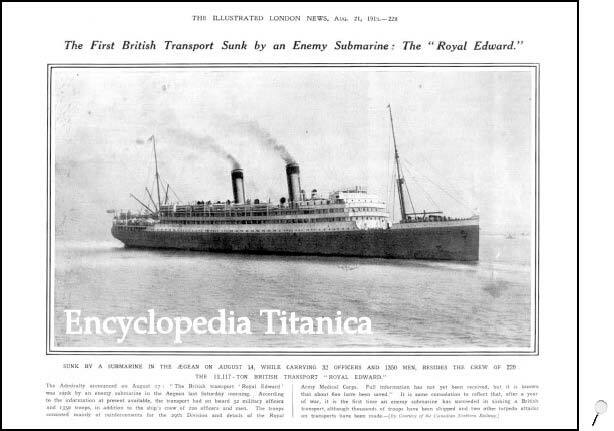 The liner was the 11,117-ton Royal Edward, and she had over 800 passengers aboard. The Captain was Peter Millman Wotton, and he was looking at a mountain of ice less than two ship lengths away. But the ghost of William McMaster Murdoch was also on the bridge. Captain Wotton, aged 35, remembered the fate of the Titanic, and heeded the lesson well. This little-known incident occurred in May 1914, and might have added to the long litany of disasters at sea. Ironically it did not receive much attention at the time because the good news was immediately drowned out by familiar catastrophe  in this case the sinking of the Empress of Ireland in the St Lawrence seaway with massive loss of life a few days later. It is announced that the Canadian liner Royal Edward, which, as reported on Sunday, struck an iceberg 110 miles east of Cape Race was going dead slow at the time in a dense fog. The stem was twisted and the liner was leaking in the forepeak, but the damage was not serious. She was bound at the time from Montreal for Bristol. A wireless message received from the German liner Frankfurt at Plymouth states that many icebergs were passed on May 19 in Lat. 41.44 N., Long 48.20 W.
It can be seen that the seasonal ice was once more much further south than was usual. The Frankfurt, of the North German Line, had responded to the Titanics distress calls two years earlier and was told he was a fool. On the same occasion in 1912, the Royal Edward herself had reported bergs in Lat. 42. 48 N. Her reports were entered in evidence at the Mersey Inquiry. Now the Frankfurt was describing ice in virtually the same vicinity in which the White Star liner sank. The steamship Royal Edward, of the Canadian Northern Company, docked safely at Avonmouth Docks, Bristol, on Friday night, from Montreal and Quebec. On her voyage across the Atlantic she struck an iceberg, but received very little damage beyond a twisted stem and a few buckled plates. The collision occurred last Friday week in a dense fog while the vessel was proceeding dead slow. The berg was sighted only two ship's lengths away, and not more than a minute elapsed before the vessel struck, despite the fact that the engines were reversed with remarkable promptitude. The passengers speak very highly of Commander Wotton's nerve and coolness. When he saw that it was impossible to avoid the berg, he took it end-on instead of starboarding the helm and risking extensive damage alongside. The passengers' appreciation of the Captain's seamanship was conveyed to him in a congratulatory letter signed by all on board. Great praise was also bestowed on the stewards and all the crew for the courageous stand they took during the trying time. The Empress of Ireland was spoken by the Royal Edward last Thursday week, and reported having passed ice and two bergs during the night. 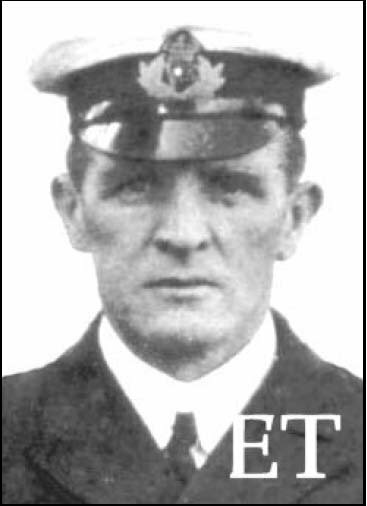 Captain Wotton, commander of the Royal Edward, saved his vessel by a brilliant piece of seamanship in the Atlantic. In a thick fog an iceberg appeared on the bows. Captain Wotton deliberately avoided a glancing blow by taking the iceberg stem on. Only the stem was damaged. While Wottons holding course overrides all else, it is noticeable that the Royal Edward was proceeding dead slow, and took a whole minute to collide. It was claimed in the case of the Titanic that she took 37 seconds to strike the iceberg from when she was first seen. It may be that the Royal Edwards berg was presenting a very broad face, since one minute would normally be ample time at any speed to avoid even a large growler. IT is, then, a curious fact that the worst ice season on record - in 1912 - was swiftly followed by another, in 1914. After passing Cape Race, four days out from Montreal, the icefield was found to be so extensive and the icebergs so large and numerous that the engines of the liner had to be stopped at one point for nearly 16 hours, the day's run falling to 163 miles. If there was a growing sense of unease at the situation in shipping circles, it was hardly lessened by the fact that the maiden voyage of the newest Largest Vessel in the World was just two days away. ATLANTIC ROUTE CHANGE LOWER TRACKS IN CONSEQUENCE OF ICE. On the eve of the departure of the Aquitania on her maiden voyage the Cunard Company announces that in view of the latest reports of ice, all the lines party to the Track Agreement have agreed on a temporary modification of the Atlantic tracks. Since February 2, when the lower ice routes came into operation, west-bound liners have been crossing longitude 47 West - known as the "Corner" -in 41.30 N., and east-bound vessels have been crossing the point in 40.30 N.
West-bound liners are now to cross the "Corner" is 40.40 N., 50 miles lower, and east-bound liners are to cross it in 40 N., 30 miles lower. The "Corner" is about 1,550 miles due east of New York, and between Northern Europe and that point the liners make a circular course, so that the extra mileage caused by crossing the "Corner" at a more southerly point will be very slight. The west-bound liners will be crossing the "Corner" 80 miles lower than before the loss of the Titanic, and the east-bound liners 60 miles lower. Many reports of ice have been received this year, though the vessels in the Canadian trade have naturally been most affected. 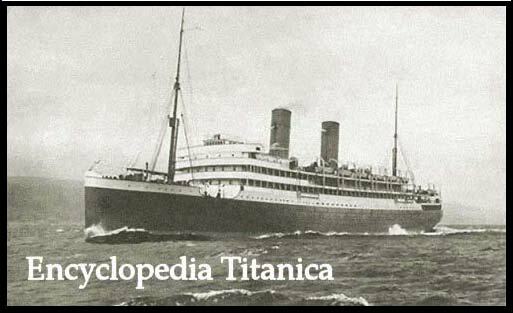 the Lusitania) adopted the utmost prudence in the ice zone, despite making the corner in no less than fifty miles lower latitude than before. The Times reported on June 5, 1914 (p. 8) that the Aquitania in the vicinity of ice did three hours dead slow on her inaugural crossing. Perhaps she too was mindful of one William McMaster Murdoch. The Royal Edwards reprieve did not last long. She was sunk by a German submarine in the Aegean on the mariners dreaded day, Friday the 13th of August, 1915. It was just one year and three months after she had successfully struck the iceberg. Captain Wotton was lost in the sinking. So too were a further 1,000 lives. Only 600 were reported to have been saved out of 1,350 British troops and 32 officers of the 29th Division, together with a ships complement of 220 officers and men. A staggering toll of casualties - whose very obscurity underlines how the cruellest machination of war is swiftly lost in the public mind when set against a peacetime mischance. Thus it is that a letter from hundreds of passengers grateful for being spared an icy death has been nonetheless claimed by the sea. But we remember William Murdoch. And sometimes with advantage.